Kat Von D Studded Obsession Studded Kiss Collectors Edition Set Now Available At Sephora | Top Beauty Blog in the Philippines covering Makeup Reviews, Swatches, Skincare and More! 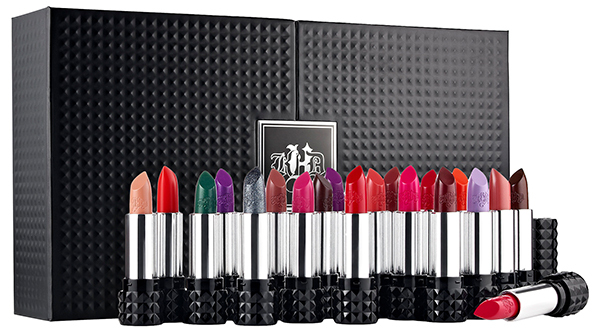 Fuel your Studded Kiss obsession with the ultimate collection of Kat’s award-winning lipstick. In celebration of the one-year anniversary of Studded Kiss, Kat’s chosen the best of the best — bold pops, reds, pinks, and nudes — to craft this collector’s edition of 20 must-have lipsticks. The set features hard-to-find favorites and the newest signature shades. The lipsticks are perfectly nestled in a chic black keepsake case, ideal for storing and displaying the collection. It also includes a gorgeous insert with a personal note hand-signed by Kat, plus four awesome Studded Kiss shade pairings for totally fearless lip looks. Kat also reveals the personal stories behind each lipstick, letting you in on the muses and memories that inspired all of her incredible shades. This revolutionary lipstick is formulated with Color Cushion Technology™ that combines long wear, bold payoff, and velvet-touch comfort so you can drench your lips with insane color and unstoppable femininity. They look AMAZING ! WOW ! !